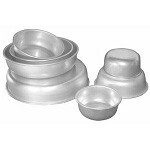 Our 3" deep Contour shaped cake pans are the professionals choice for fondant cakes. The gentle rounded bottom minimizes cracking and creates a smooth and soft look on the edges. Manufactured from premium 16 gauge anodized aluminum and available in 7 sizes to suit any need.